Our government is failing us. From health care to immigration, from the tax code to climate change, our political institutions cannot deal effectively with the challenges of modern society. Why the dysfunction? Contemporary reformers single out the usual suspects, including polarization and the rise in campaign spending. But what if the roots go much deeper, to the nation's founding? 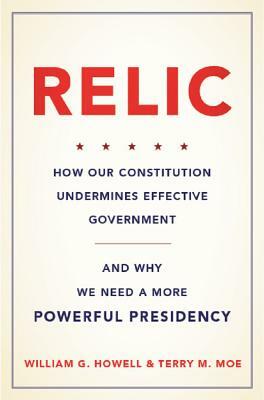 In Relic, William G. Howell and Terry M. Moe point to the Constitution as the main culprit. The framers designed the Constitution some 225 years ago for a simple, agrarian society. But the government they created, with a parochial Congress at its center, is ill-equipped to address the serious social problems that arise in a complex, postindustrial nation. We are prisoners of the past, burdened with an antiquated government that cannot make effective policy, and often cannot do anything at all. The solution is to update the Constitution for modern times. This can be accomplished, Howell and Moe argue, through reforms that push Congress and all its pathologies to the periphery of the lawmaking process, and bring presidentswhose concern for their legacy drives them to seek coherent policy solutionsto the center of decision making. As Howell and Moe reveal, the key to effective government for modern America is a more powerful presidency. Relic is a provocative and essential book for our era of political dysfunction and popular despair. It sheds new light on what is wrong with our government and what can be done about it, challenging us to reconsider the very foundation of the American experiment. William G. Howell is the Sydney Stein Professor in American Politics at the University of Chicago. His The Wartime President won the William Riker award for the best book in political economy. Terry M. Moe is the William Bennett Munro Professor of Political Science at Stanford University and a senior fellow at the Hoover Institution. Moe is a member of the American Academy of Arts and Sciences.